Work continues on 7828. Despite the carriage shed becoming a sauna, the beading junctions have been fitted, sealed down, pins punched, filled and sanded. Half of the roof guttering has now been fitted, and the recently fitted roof ventilators have been glossed, along with the centre portion of the roof. Completion of the gutter allows final sealing and painting of the roof to take place, so the second half is a priority. The strips of beading to connect the junctions are next on the machining list. 7828 was never modified to allow it’s gangways to be connected to a BR Mk.1/Pullman/LNER gangway. This is fine if we want to run it with just LMS/GWR carriages, but as at least initially 7828 must be compatible with Peak Rail’s Mk.1 stock, a gangway must have additional clamps and platework added. 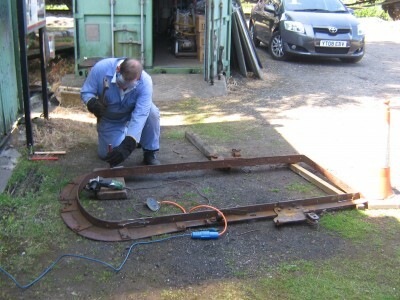 Rather than cut and weld the original part, the south end gangway has been selected to be fitted with a replacement gangway end portal. 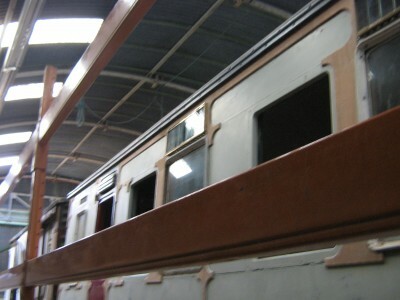 The donor gangway was sourced from LMS TO No.8422, the carriage which was a WWII ambulance, repatriated from Germany after the war, and one time resident at the Longmoor Military Railway. It has lost it’s original gangways, gaining some off something else instead. 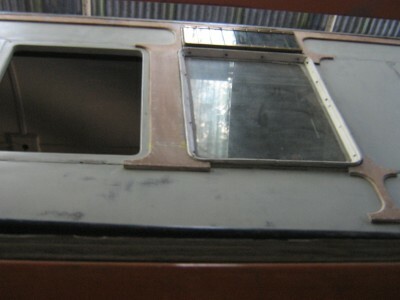 When it is restored at Rowsley, they will need to be dismantled and rebuilt anyway, so for the time being it has been possible for 7828 to ‘borrow’ a gangway portal – which happens to have full adaptor gear. This has been removed from 8422, stripped back of all fittings, cleaned down and painted. Some surplus outrigger brackets have been removed, and the portal is now ready to have swivels reattached, prior to fitting to 7828 with new bellows. Work continues apace on the patterns for the light fittings, and the first step in the production of the replacement interior passenger communication cord fittings has been undertaken, with an order for the 3 patterns placed. Samples of moquette have been received, and discussions continue on the production of the replica ‘fawn rep’ which the carriage will be trimmed with when completed.